mat window size: 13 x 13 in. Malick Sidibé began his life herding animals in a small village in Mali before the village chief chose him to go to the white school in Yanfolila for an education. Sidibé was attracted to art as soon as he began school, doing drawings for official events while in high school. Those charcoal drawings helped Sidibé get accepted to study at the Institut National des Arts de Bamako. 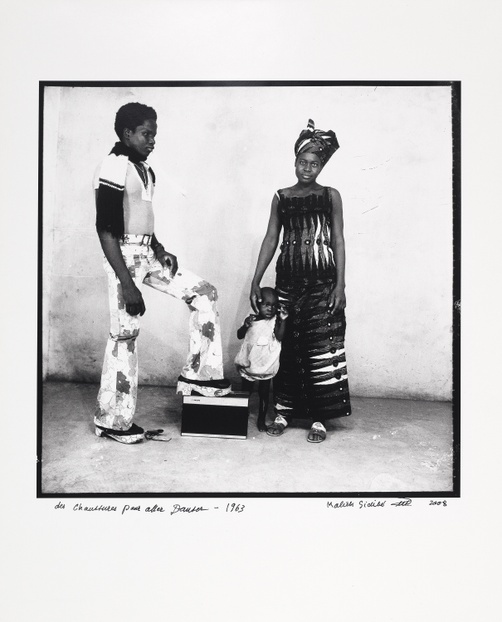 While at the Institut, the young artist was noticed by photographer Gérard Guillat-Guignard, whose mentorship profoundly influenced Sidibé’s artistic medium and career. Sidibé was incredibly prolific in his work. His street photography captures the vibrancy and excitement of life in Bamako, Mali’s capital, during the mid-twentieth century. He captured his subjects, the lively youth of the city, in the streets, nightclubs, and beaches of Bamako after the country’s independence from France in 1960. Sidibé captured the ethos and energy of cultural freedom, optimism, and enthusiasm at this time. Within this context of independence, an African like Sidibé photographing other Africans helped redress the colonial power dynamic. 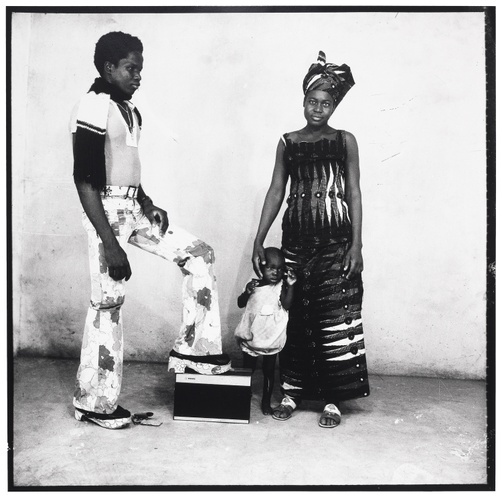 As time passed and Sidibé received more commissions from middle-class families wanting documentation of their lives, Sidibé moved inside to a studio practice. His use of patterned backdrops served as the perfect milieu for his young subjects, as they were often dressed in patterns that seem to vibrate in relation to the backdrops. The excitement of this vibration mirrors the excitement in the eyes of the subjects. The positive energy and comfortable environment of the studio is clear, for example, in Vues de dos—Juin, as the subjects’ backs are facing the camera. This was a scandalous pose for a woman to be in at this time, and would only have been undertaken in an environment where the subjects could be at ease. Africa Pop Studio positions Sidibé as a source and touchstone for a new generation of artists who have adapted his aesthetics and spirit to establish their individuality and address expansive, global contemporary issues. His influence on artists practicing today in Africa and the diaspora, such as those in this exhibition, cannot be underestimated.